The William & Mary Committee on Sustainability has announced the fall 2015 Green Fee Awards. A total of $68,333 has been dedicated to sustainability projects around campus this semester. The Green Fee program began as a grassroots student initiative in 2008. Since then, it has funded hundreds of sustainability projects led by students, faculty and staff around the William & Mary campuses. This semester saw a wide variety of proposals, from campus-wide initiatives to innovative sustainability research projects. Summaries of each of the projects are listed below. The funding provided by the COS will allow William & Mary bee-keepers to test the use of plastic beehive materials on campus. Many farmers and beekeepers have used wooden frames for keeping bees and harvesting honey for centuries. These materials are readily available and easy to find. However, some inventors have recently started using recycled plastic frames to keep bees and harvest honey. This diverts plastic from landfills and reduces the carbon footprint that results from harvesting trees. An additional benefit of the new frames relates to the process of harvesting honey. The traditional approach involves removing frames with bees on them and using smoke to subdue the hive- potentially aggravating the hive. The process also removes all the honey when the frames are spun. The new method uses the twist of an external knob, which causes honey to flows out of the hive without disturbing the bees. The harvester can leave behind some of the honey for the bees so they will not starve. The recycled plastic frames also reduce the ability of small hive beetles from eating the frame and colonizing, since the new frames are not pliable and the beetles cannot deposit their eggs into the frame. Overall, a colony’s health could be improved by the use of plastic frames. W&M Law School's Student Environmental & Animal Law Society (SEALS) will use its COS funding to install rain barrels on the Gradplex to mitigate the flow of rain water into the detention pond behind the law school, allowing the banks to dry out more quickly after rainfall. Meanwhile, facilities management will work on stabilizing the structure of the detention pond. Stabilizing the banks is the first step in a comprehensive plan to improve the detention pond, and next semester SEALS will continue the project by removing invasive plants from the area around the detention pond and replacing them with native, rain-loving plants. Crim Dell is the visual centerpiece of campus, yet water quality has degraded dramatically in the last decade. This COS-funded project will test whether the delivery of nutrients that cause algal blooms can be reduced by installing a reactive, fibrous mat through which water must flow prior to discharge into Crim Dell. The mat will be designed by a manufacturer to “form fit” the groundwater discharge point in Crim Dell. Microbial and geochemical sorption processes are expected to remove nitrogen and phosphorus from the water, thereby reducing algal growth. Students will measure water quality before and after installation to track changes in the health and visual appeal of Crim Dell. In order to encourage the use of reusable water bottles on campus, the COS will provide additional funding for the installation of two water bottle filling stations in the ISC. This will provide filtered and accessible tap water to the students, faculty, and visitors of the chemistry, biology and psychology departments. Filling stations will help reduce disposable water bottle use on campus, both decreasing waste output and promoting the sustainable and economic alternative of tap water. 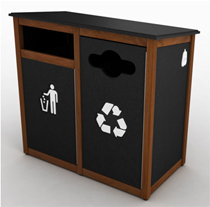 As part of the process to create a comprehensive single-stream recycling program across campus, the COS will fund three new recycling bins for the Sadler Center. These new bins will create more access to recycling in a high traffic area of campus and replace the current type-specific bins in the building. The COS will fund the purchase of a new Bookeye Scanner in the Swem Library. The current scanner will be moved to the physics library in Small Hall, helping both the physics department and library save paper and ink. The new Swem scanner will allow students to upload the PDFs right to their mobile devices. The scanner currently in Swem averages over 1,100 uses per month, saving thousands of reams of paper per year. The Native Plant Nursery has healthy seedlings of seven hardwood species, grown from acorns and seeds collected from the W&M environment. The COS award will purchase tree protectors, stakes and forestry labels to protect young trees from deer predation and encourage continued survival of native trees, contributing to campus biodiversity. In an ongoing effort to decrease plastic bottle use at William & Mary, COS will fund the installation of a new refillable water station in William & Mary Hall. This new refillable station will provide filtered drinking water to members of the campus community. Refillable water stations eliminate the taste issues some individuals have with tap water and encourage the use of reusable water bottles. Similar refillable stations have been successful at the Student Recreation Center, Sadler Center, admission building and Marshall-Wythe School of Law. The COS will provide a grant that covers two-thirds of the cost and installation fees for three serpentine-style bike racks: two at Swem Library and one at Washington Hall. The rest of the funds will be provided by Parking and Transportation Services. Cycling is a low-emissions form of transportation, but currently many bike racks are at capacity. By providing funds for three new racks at these strategic locations, we will allow more students, staff and faculty to bike instead of drive to their class, office or meeting. Over time, the presence of more bike racks will produce a built environment that encourages cycling over other less-sustainable forms of transportation. SEAC Gardens members erected a Garden Shelter this summer, but the floor was left unfinished. To complete the project according to the original shelter proposal, COS will provide a grant to lay a brick floor and build benches to place in the structure. Brick flooring and benches will improve the space’s visual appeal and usability. The finished project will give members of SEAC and the Campus Gardens a space to gather and organize gardening activities, thereby teaching students and the larger campus community about gardening and its connections to sustainable food systems. To promote the importance of wetlands, living shorelines and the sustainability of our coastal ecosystem, the COS will fund the creation of an interactive wetlands exhibit in the VIMS Visitors Center. This project will utilize a living wetland exhibit, enclosed in an aquarium and consisting of aquatic shallows, upland sands and native plants and animals. Additionally, an interactive exhibit face including slide-outs and various components will incorporate hands-on activities related to VIMS research. This multifaceted approach will appeal to young visitors, homeowners, decision-makers and community planners. Park Rx partners with healthcare providers, providing them the training and tools to ‘prescribe’ their patients time in area parks to enhance mental and physical health and treat and prevent lifestyle driven illnesses. The COS-funded Phase II of GWA Park Rx will improve upon and scale up the program on campus and in the broader community. These next steps include 1) improvements to the healthcare provider website to make the system more useful and usable for doctors, while providing a way to monitor program use, 2) maintenance of a public-facing website to promote the program with the public, and 3) supply of prescription materials to doctors. These steps will serve to refine and expand the program and offer additional support to providers. Data collected in the process will enable future research investigating program health outcomes and methods for maximizing the benefit of Park Rx programs in Williamsburg and in other communities. Since 2012 the VIMS Community Garden has provided space for VIMS faculty, students and staff to grow healthy food for their families, recycle organic waste via composting, and build a sense of community through the exchange of environmentally-friendly gardening knowledge. The COS will provide funds to build a new garden perimeter fence that will function to reduce crop damage from nuisance mammalian wildlife, enhance garden area aesthetics and facilitate the installation of features that will attract beneficial wildlife (nesting houses for songbirds, flowering perennial plants for pollinating insects). These additions will improve garden crop productivity and set an example for others to establish and maintain a garden at their home, school or community meeting place. In an ongoing effort to decrease plastic bottle usage and increase sustainability on the William & Mary campus, the Committee on Sustainability will fund the installation of one new refillable water bottle station in the School of Education. The School of Education is a LEED Gold certified sustainable building, and the addition of the refillable water bottle station will continue to increase sustainability awareness for students, faculty, staff and visitors of the building. William & Mary’s campus has an extensive collection of conifer trees from all over the world. Last year, walking tour was created that highlighted different trees from all seven continents in order to promote appreciation of campus’ biological diversity. The tour also consisted of a map layer that can be accessed online with more information on each species. The COS funding will help finish the tour by adding tree markers to each specimen on the tour to make identification easy and promote environmental education and interest.